Since World War II, joint force land component commands (JFLCCs) have been employed around the globe to achieve unity of effort in the land domain during major combat operations. A JFLCC is established by a joint force commander to integrate and synchronize maneuver, fires, and interdiction in the land domain. In many historical instances, these commands were formed as a crisis escalated by personnel with little knowledge of the specific theater of operations and limited pre-established personal relationships with their counterparts in other services. Coordinating landpower and advising the joint force commander on its use and application are hardly objectionable goals. But an outsider looking in might ask, “Why establish another organization within a service component command to do something it has presumably been doing all along?” In other words, why activate something that has no additional authorities to “do” anything? More often than not, staffs at the strategic and operational levels leave these uncomfortable questions for resolution during crisis action planning. Joint force planners must do the prudent planning up front to determine the requirements for theater armies to serve as both Army service component commands and joint land component commands in conflict. This article provides a brief historical rationale for the existence of joint land component commands and why they are essential to joint operations. The commander of U.S. Pacific Command realigned his service component commands into theater functional commands in December 2012. Army service component commands are the senior Army commands assigned to combatant commands and are responsible for recommending the allocation and employment of U.S. Army forces. To achieve unity of effort among joint forces in the land domain, U.S. Pacific Command directed U.S. Army Pacific to establish a Theater JFLCC, with support from Marine Forces Pacific and Special Operations Command Pacific. In many ways this organizational structure formalizes what service components have been doing in the U.S. Pacific Command area of responsibility for 70 years—coordinating with one another and synchronizing the application of landpower. U.S. Army Pacific’s Theater JFLCC Coordination Center is accomplishing the tasks for which it was established, but it could do more. Although theater armies are not organized or equipped to function as JFLCCs, they are increasingly becoming the force of choice due to their regional understanding, assigned relationships, and capacity. Although sometimes contentious, organizing by functional competency offers distinct advantages. Indeed, functional components have been used by joint force commanders since World War II, albeit not always effectively. In World War II, U.S. Navy Admiral Chester Nimitz served simultaneously as the Commander in Chief, Pacific Fleet and the Commander in Chief, Pacific Ocean Areas, roughly similar to today’s Pacific Fleet and U.S. Pacific Command, respectively. In these capacities, Nimitz answered to himself, which created confusion as it was not clear at times whether he was acting as a fleet commander, an area commander, or a theater commander. In fact, because of the ambiguity, Nimitz’s command structure often led to friction between Navy and Army forces operating in the Pacific and word of this spread to Washington. During the Marianas Campaign in 1944, Nimitz could have benefited from a single commander for joint land operations. 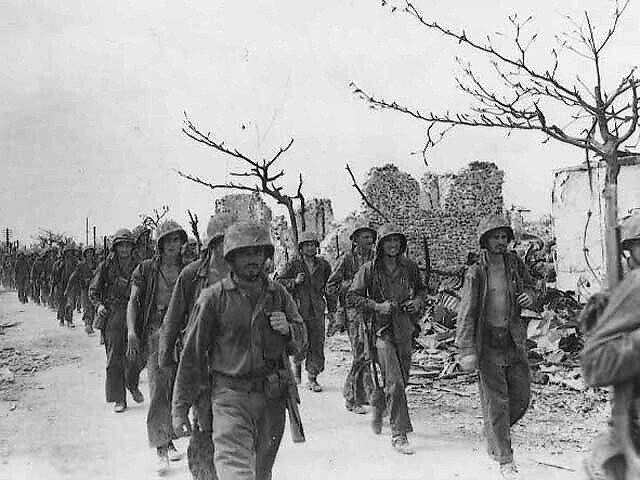 For example, during the capture of Saipan, U.S. Marine Corps Lieutenant General Holland Smith commanded the joint expeditionary ground troops with a Marine headquarters that included the 2nd and 4th Marine Divisions and the Army’s 27th Infantry Division under his operational control. Although the 27th Division was an afloat reserve force, Smith committed it on the second day of the operation—before it was clear if the Marines actually required reinforcements. Once committed, Smith reorganized the 27th and applied it piecemeal to the existing formations, which resulted in a disjointed land campaign, poor timing, excessive casualties, and the eventual relief of the 27th Division commander, U.S. Army Major General Ralph Smith. Lieutenant General Robert Richardson, commanding general of the Hawaiian Department and all Army personnel in the Pacific Ocean Areas, sensed this lack of unity in the land domain in the forward locations and asked Nimitz to make him his deputy commander of all ground forces, what would today be called a Theater Joint Force Land Component Commander. Nimitz refused, stating that it would be embarrassing for him to allow an Army officer to command Marines. Despite the setbacks in the Pacific in 1944, several months after the capture of Saipan, Nimitz’s subordinate Fifth Fleet and Task Force 51 commander, Admiral Raymond Spruance, was able to effectively task organize joint land forces for the battle of Okinawa. Operation Iceberg was the largest amphibious assault in the Pacific in World War II and is a model of joint service cooperation and mutual support. Richardson activated Tenth U.S. Army under Lieutenant General Simon Buckner for operations in the Central Pacific, which included Okinawa. Administrative control of Tenth Army belonged to Richardson while Spruance exercised operational control. Initially, the Tenth Army was composed of about 182,000 assault troops from the Army’s XXIV Corps and the Marines’ III Amphibious Corps. Tenth Army’s Tactical Air Force was built around a Marine air wing and augmented by Army Air Force elements. Overall, Tenth Army’s joint land forces successfully established bases to attack Japan’s main islands, sever Japanese lines of communication, and maintain unremitting pressure on the Japanese military. While the Battle of Okinawa has been somewhat overlooked in that it came at the end of the war, Tenth Army’s organization provides an excellent example of a successful JFLCC in action. Command and control of land forces during the initial days of Operation Iraqi Freedom was just as tumultuous as it had been in previous conflicts. At the outset of crisis, Lieutenant General David McKiernan, Commander of Third U.S. Army, was dual hatted as an Army service component commander and the land component commander. For these tasks, McKiernan’s staff grew to some 1,300 personnel. Following the successful invasion and removal of Saddam Hussein’s regime, McKiernan briefly became commander of Combined Joint Task Force-Iraq (CJTF-I) and was responsible for overseeing the military “occupation” of Iraq. Unfortunately, in June 2003, Lieutenant General Ricardo Sanchez, V Corps commander with only about 328 staff members, transitioned his headquarters to Combined Joint Task Force-7. This task force replaced the Third U.S. Army as the operational headquarters because the U.S. Central Command commander directed McKiernan to focus on the entire theater of operations. Although not manned, trained, or equipped for the mission, Sanchez found himself in command of all U.S. and multinational forces in Iraq. Virtually overnight, Sanchez’s staff grew to roughly 1,300 personnel. Tasked to continue planning and conducting combined arms operations and wide area security at the tactical level, General Sanchez had the additional responsibility of managing the war at operational and strategic levels. Sanchez and his staff had immense responsibility managing three levels of war. Sanchez’s staff not only dealt directly with the host nation to train and certify the Iraqi Armed Forces, but also reported to the Coalition Provisional Authority, U.S Central Command, and politicians in Washington. The political-military aspects consumed the staff and six months passed before General Sanchez could convince Washington to establish an adequate command and control structure. Moreover, the rotation of U.S. combat forces and the employment of III Corps as the operational and tactical headquarters slowed the transition from Combined Joint Task Force-7 to the four-star Multinational Force-Iraq another six months. By that time, the war had changed from a conventional war to a counterinsurgency, and the first year of combat was essentially lost. Although ground-centric, Combined Joint Task Force-7 desperately needed a subordinate land component to plan and synchronize land operations. Had Sanchez had a subordinate land component to assume all the operational and tactical tasks associated with securing Iraq, it is probable that Combined Joint Task Force-7 could have better managed its resources and responded more quickly to allies, partners, and politicians in Washington. As seen in the two examples above, the employment of a task-organized, land component commander responsible for joint operations offers commanders much more flexibility. A structure like this one provides expert advice on the organization and employment of land forces during planning to achieve campaign objectives. It can also synchronize operations in the land domain to reduce redundancies. Even when commanders consider themselves practitioners of ground warfare, delegating that duty to a subordinate allows them to remain strategically focused, making informed decisions and dealing with the political-military aspects of war. Of course, land component commanders are not always politically acceptable because of the signal sent by placing boots on the ground in a foreign land. Nevertheless, the last two U.S. Pacific Command commanders have found value in them—as Nimitz eventually did and Sanchez might have—perhaps because of the inherent benefits. John Opladen is a U.S. Army strategist at Headquarters, U.S. Army Pacific. He holds a BA from Hofstra University and an MA from American University. His experience includes three combat tours in Afghanistan and one in Iraq. Jeremy Sauer is a U.S. Army strategist at U.S. Army Human Resources Command. He holds a BA from Boise State University and an MS from the Colorado School of Mines. His experience includes three combat tours in Iraq. The views expressed are their own and do not reflect the official position of the U.S. Army, the Department of Defense, or the U.S. Government. U.S. Joint Chiefs of Staff, Joint Publication 3-31: Command and Control for Joint Land Operations (2014), x. Department of the Army, Field Manual 3-94, Theater Army, Corps, and Division Operations (2014), 1-18. U.S. Pacific Command, Theater Joint Land Force Land Component Commander (TJFLCC) Implementing Directive (February 2014). Robert V. Urquhard, Jr., “The Army Service Component Command: Critical to Force 2025 and Beyond,” in Futures Seminar: The United States Army in 2025 and Beyond: A Compendium of U.S. Army War College Student Papers Volume Two (2015), p. 46. Louis Morton, Strategy and Command: The First Two Years (Washington D.C.: Center for Military History, 2000), 256. The Papers of George Catlett Marshall, vol. 3, “The Right Man for the Job,” December 7 1941-May 31, 1943 (Baltimore and London: The Johns Hopkins University Press, 1991), 400. Robert C. Richardson, A Soldier’s Life, “Capture of the Marianas,” 1-14. John A. Bonin, “Joint and Army Planning – Joint Land Operations” (Lecture presented at U.S. Army War College, Carlisle, Pennsylvania, December 2015). Donald P. Wright and Timothy R. Reese, On Point II: Transition to the New Campaign (Fort Leavenworth: Combat Studies Institute Press, 2008), 27-31, 38-42, and 144-149.